Many years ago in Austin, a friend and I hosted a birthday dinner for a friend who worked with us in the library. That was during what I call my "social period," when I was quite the social butterfly. I'm not sure what happened since I'm such a stay-at-home gal these days. This was just one of many such celebrations. Our friend brought his current girlfriend, a nice-enough woman whom I had not yet met and never really got to know since I believe they broke up not long after this dinner. Not that the dinner had anything to do with their breakup. At least I hope it didn't. At any rate, if memory serves, Mary made the dinner and I made the dessert - the famous top-secret chocolate cake. Now keep in mind that, at that time, this was a quite special and, as yet, still secret family recipe. It was in great demand, and was always well received. Even if I had been a total social misfit, which I do not believe for one second, it would have been my ticket into any event I wished to attend. So imagine my surprise when this girlfriend announced to me in the kitchen, as I was icing the cake, that she had stopped eating sugar and would not be having a piece of my cake. (What she was doing in the kitchen with me I do not remember, but I have a clear memory of the two of us together in the kitchen as she told me this.) Imagine my dismay: how could I impress her with my wondrous baking skills if she didn't eat any of my cake? But she was resolute, and was not even tempted. And ever since then, I can't think of ketchup without thinking of 1) sugar, and 2) that night. And I have realized that is probably why I love ketchup, seeing as how I lean heavily towards sweet. But I have been avoiding it, since I have been avoiding commercially processed foods. The few times I use it are those few times I order a crisper and fries (ok, sometimes a cheeseburger) from Eat a Pita and shamefully have it delivered to my door. If I am completely honest, I will admit that fries are merely the vehicle for my ketchup fix. All things considered, I think I have been most excited about making ketchup. So why did I wait so long to make it? I still had some Heinz ketchup that I needed to work through and, since I use it so seldom, it took me a while to work through it all. But a nice batch of okonomiyaki with its attendant sauce took care of that, so last weekend I was ready to make some ketchup. 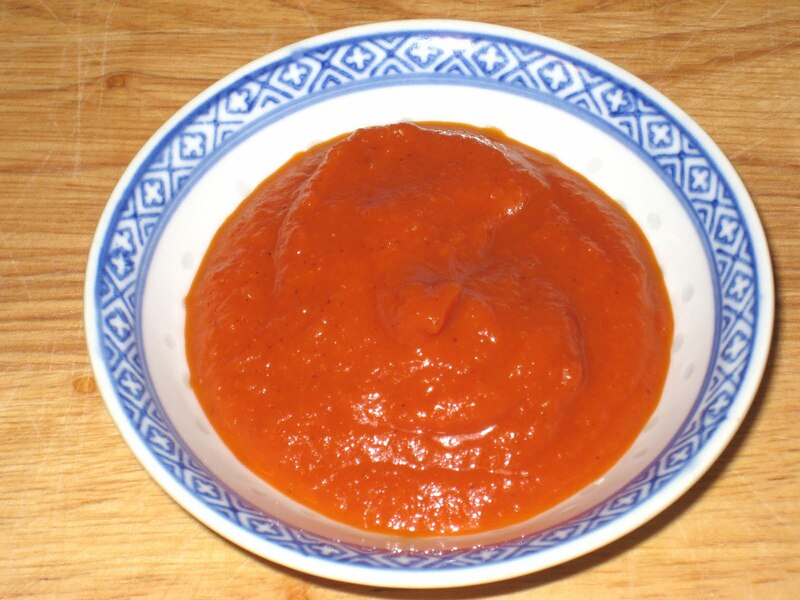 Like its DIY Condiments predecessors, ketchup is surprisingly easy to make. You just saute onions and garlic, add the rest of the ingredients, let it simmer for a while, and then puree it with your super duper handy dandy stick blender. Although it looks nice and tomato-red in the picture, at least on my monitor, the reality is slightly less red. It had that deep ketchup red in the pot, but after I pureed it the onions were just enough white to dilute it to more of a pinkish orange. But looks aren't everything. As for the taste, I think it has definite possibilities. It is a little too sweet even for my taste, but that might be a result of over-packed brown sugar. But it ends with a lovely tang of spiciness that counteracts the sweetness, and the flavor has intensified as it has sat in the refrigerator. I might do some more experimenting with it, but not much. Now I just have to find some uses for it - it's too good for french fries. I do already have some ideas. Puree the tomatoes with their juice in the can with a stick blender until smooth (or use a regular blender). Add the spices and cook, stirring constantly, for 1 minute. Add the pureed tomato, tomato paste, brown sugar,and vinegar. Bring to a boil, then immediately lower the heat and cook uncovered until very thick, 45 to 55 minutes. Stir occasionally, making sure the liquid doesn't burn on the bottom of the pan. Use the stick blender to puree everything together. Let cool and pour into a glass container. Refrigerate. Keeps chilled approximately 1 month.